Add green pepper and jalapeño to the pan and saute for 3-5 minutes or until softened. Add celery and cucumber to the pan and saute 2-3 minutes more until softened. Stir in broth and water, lentils, and spices to taste. How much curry do you like? 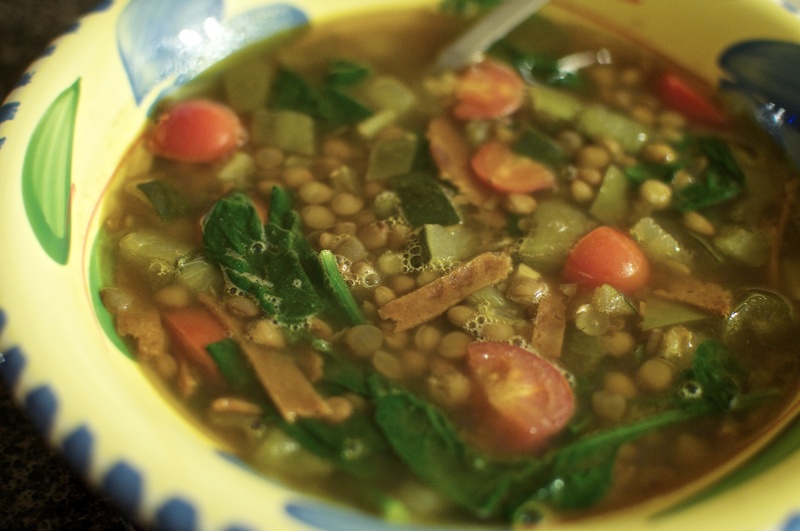 Bring to a simmer and cook 20-30 minutes until lentils are soft. Meanwhile, prepare the bacon seitan as the packaging instructs. Set aside. Once lentils are softened, add bacon seitan, spinach, and tomatoes to the soup and simmer until spinach is wilted. Posted June 16, 2013 at 6:43 pm in Cooking, Recipes and tagged 2013, Cooking, food, improv, photography. Comments RSS. Post a comment.